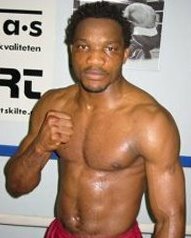 Exclusive Interview by James Slater – 37-year-old Lolenga Mock, 28-12-1(12) is a fighter who is probably best known to the majority of fans for his incredibly exciting, but losing fight with David Haye. The two met in September of 2003 and the man who was born in Kinshasa and who now lives in Denmark had Haye down in the 2nd-round. To this day, Mock, who was TKO’d in the 4th, maintains Haye was given extra time to recover from the right hand that decked him and that he himself was stopped somewhat prematurely. Also having rumbled with top names like Charles Brewer ( a win for Mock), current IBF super-middleweight champ Lucian Bute, Mario Veit and, last time out in March of 2009, current WBA light-heavyweight ruler Gabriel Campillo (all points losses for the man who calls himself Lumumba Boy), Mock has proven his toughness. The former two-time European Union super-middleweight champion gets a chance to regain his old belt one more on January 30th in Denmark, as he faces what has just been changed (according to BoxRec) to a TBA – as original foe, 27-year-old Frenchman Medhi Boudla, is now set to box in France instead of facing Mock as was originally the plan..
Mock has not seen much of Boudla in action, but he is not in the least concerned. Nor is Mock worried about the fact that he is ten years older than the Frenchman. Mock feels a win could lead him towards a world title fight, and there is one man at the top of his list. Mock will have been out of the ring for over nine months by the time Jan. 30th rolls around, yet he says he has been keeping sharp by doing lots of sparring. I asked the colourful warrior about some of his big fights. “The Lumumba Boy” spoke about two fights in particular. Mock laughed when I asked him about all the different weight classes he has fought in – middle, super-middle, light-heavy and even cruiserweight – but he says he is a natural 168-pounder now. He also refuses to listen to anyone who says he is getting on at age 37. Mock, who has literally fought all over the world, is happy to be boxing in Denmark once again.